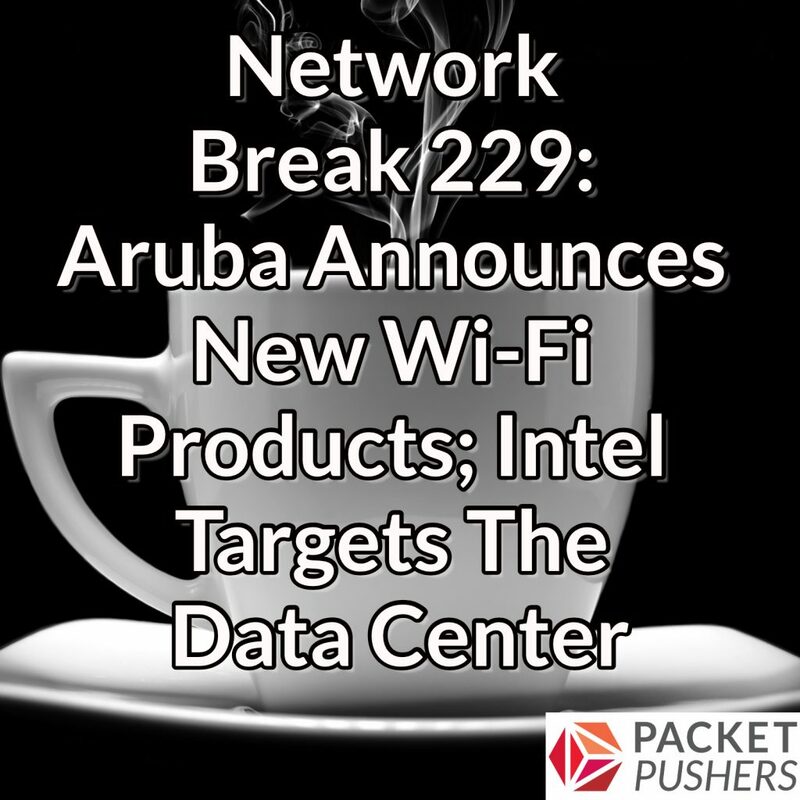 Aruba announces new 802.11ax APs and ClearPass software for device identification, Intel rolls out a slew of products for the data center including a new Ethernet adapter and a second-gen Xeon processor, and Amazon confirms plans to launch satellites for a broadband service. Citrix releases an update on the breach it announced in March, Kemp Technologies gets acquired by a private equity firm, Google dissolves its AI Ethics panel, and Cisco’s Catalyst 6500 turns twenty. The WAN Summit is the place to learn from your IT peers and experts on WAN transformation. It’s happening right now in New York City, April 8th and 9th. Go to twitter.com/WANSummit to check it out. Summits are also happening in London, Frankfurt, Sydney, and Singapore in 2019. You can see a full list at WANSummit.com. And it’s under $99 for enterprise registrants. Our listeners can get an extra 20% off with the code PACKETPUSHERS when they register. Is Intel’s “Innovation Day” Innovative Enough for Carrier Cloud? – CIMI Corp.
1. Aruba Central cloud-managed APs have existed as a competitor to Meraki since at least 2015. 2. Optane / 3D XPoint is a storage technology that sits in price & performance between DRAM and NAND. Optane SSDs and 3D NAND SSDs have comparable performance levels, with the Optane being bottlenecked by PCIe latency. Optane DIMMs are able to operate at much lower latencies by using the memory bus instead of PCIe. 3. Low Earth Orbit latency should be comparable to terrestrial fiber’s, for two reasons: physical fiber paths are not straight lines, and the speed of light in fiber is ~30% slower than in air/vacuum. Break-even point between theoretical latencies of LEO vs fiber is roughly 16000km, or US-East to Sydney. Going from one side of the earth to the other should be faster via LEO. Not as fast as terrestrial microwave though. LEO is only 1600 km out (~23ms roundtrip) vs Geosynchronous at 35,786 km (~240ms RTT.) TBD whether theory matches reality, but the theory is at least promising.